If you were wondering how much RAM is inside the new 2018 iPad Pro line up, we finally may have the answer. 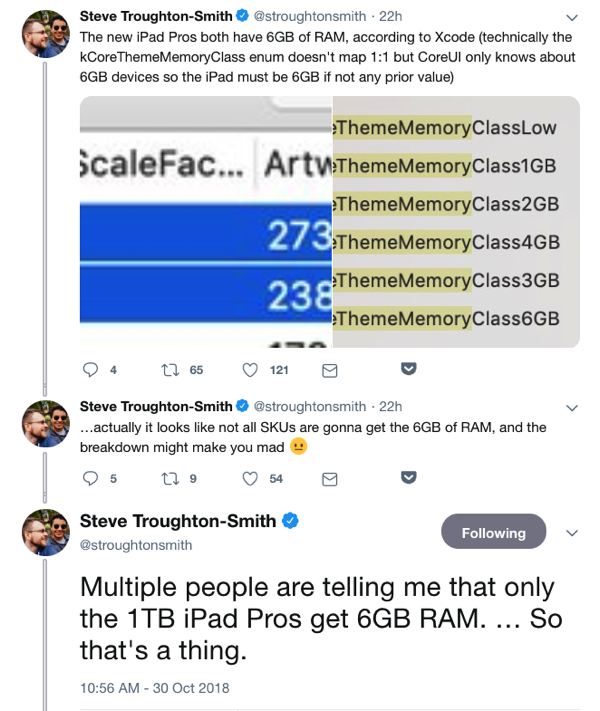 According to developer Steve Troughton-Smith, only 1TB capacity iPad Pro models have 6GB of RAM, whereas all other configurations have 4GB of RAM, like previous generations. For users deciding on a ‘future proofed’ iPad Pro model, the 1TB version with 6GB of RAM might be the way to go. However, it comes at a huge cost. The difference between an entry 64GB Wi-Fi 11-inch or 12.9-inch iPad Pro and the top-end 1TB version is $950 CAD. So if you really want 6GB of RAM with your iPad Pro, you’ll have to pay for it at $1949 and $2149 for the high-end models (Wi-Fi) at least, respectively. We’ll surely get confirmation once media reviewers publish their findings next week. There’s no reasoning why the 1TB model has the extra 2GB of RAM. Apple doesn’t normally talk about RAM for iPad Pro models. But for those who pre-ordered, I wonder if this extra tidbit of information would have made a difference during the order process.